Looking very similar to the Mig-15, the Mig-17 was a natural development of its younger and slightly smaller brother. Developed as a replacement for the Mig-15, work began in 1949 on its development. Using parts already being produced for the Mig-15, but with improved wings and tailplane. Which improved stability at higher speeds. Still a Subsonic aircraft, it proved in various actions that this was not an issue. Entering serice in October 1952, it was designed as an interceptor, when most bombers where still propeller driven. However, with the advent of bombers that could go to supersonic speeds, the Mig-17 became obselete in this role. Where the Mig-17 did excel was in subsonic air to air combat. Although its role was as an interceptor, it proved to be a very capable dog fighter. With its radar gun site, and agility at subsonic speeds, it gave the F-4 pilots during the Vietnam war a serious problem. Licence built by Poland as the Lim-5. Plus by China as the Shenyang J-5 (for Chinese use) and the Shenyang F-5 (export version). The Mig-17 was not ready for use during the Korean war, but its first combat was over the Straits of Taiwan, when Chinese Mig-17s clashed with ROC F-86 Sabres in 1958. Multi role aircraft, modified to carry unguided rockets and the K-13 AA missile. Basic fighter version but with imroved VK-1F engine, capable of afterburner use. NATO code Fresco F.
All-weather fighter version with Izumrud radar and the VK-1F engine afterburner engine. NATO code Fresco D.
Fighter version, with radar and K-5 AA missiles. NATO code Fresco E.
Reconnaissance version fitted with cameras and VK-1F engine. Albania Airforce Mig-17 and J-5 1950 to ? 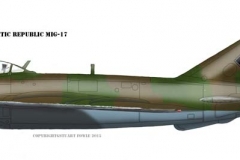 Angola Airforce and Air Defence Force Mig-17 ? Burkina Faso Airforce Mig-17 ? Cuba Airforce Mig-17 1960 to 1998? Mongolia Airforce Mig-17 1970s to ? Vietnam (North) Airforce Mig-17 1960s to ? North Yemen Airforce Mig-17 ? 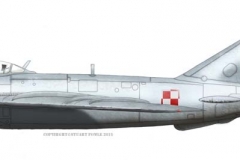 Poland Airforce and Navy Mig-17 and LIM-5 ? Romania Airforce Mig-17F and PF 1955 to ? Sri Lanka Airforce Mig-17 ?